Bottarga—cured fish roe typical of Sardinian and Sicilian cookery—is an unusual but tasty treat. It has a unique flavor that reminds me of a cross between caviar and anchovy but more delicate than either. Like a good, aged Parmesan or pecorino cheese, bottarga lends itself beautifully to grating over pasta. There are a number of ways of making spaghetti con la bottarga, but my favorite is also the simplest. 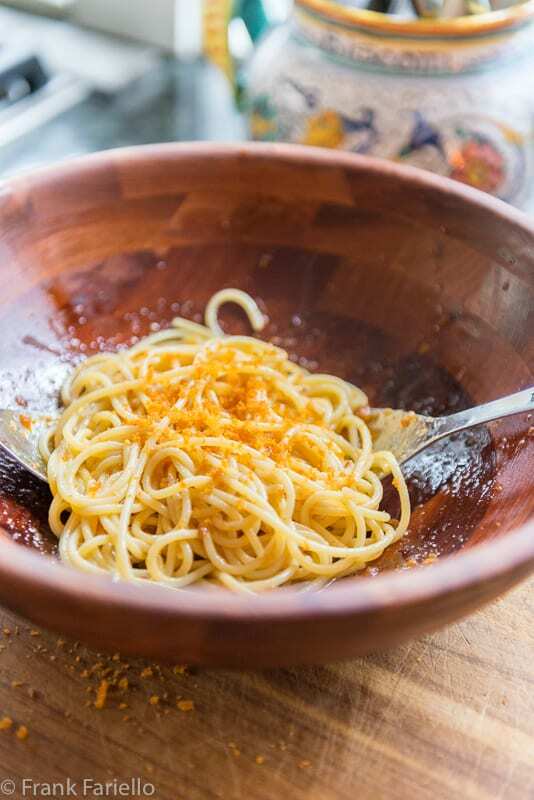 Italians often talk about ‘dressing’ pasta but here is an instance when that’s literally true: You toss the pasta with grated bottarga and best quality extra virgin olive oil in a bowl, as if it were actually a salad, until the pasta is well coated and takes on a rich orange hue. The subtlest use of garlic imaginable–just rubbing the inside of the bowl—adds just a hint of that savory allium. Cook your spaghetti al dente in well salted water. While the spaghetti is cooking, rub the inside surface of a salad bowl vigorously with the cut sides of the garlic. applying enough pressure so the garlic juices really rub off on to the sides of the bowl. If you want a more assertive garlic flavor, leave the spent half-cloves in the bowl. Add a good glug of olive oil, then the grated bottarga to the bowl. Mix with a spatula until you form a kind of cream that you can spread over the bottom of the bowl and sides of the bowl. Set aside until needed. When the spaghetti is cooked, drain it (but not too well) and pour it into the bowl. Mix everything together well, adding some more olive oil and/or grated bottarga is you think it needs it. If things are a bit dry, some more pasta water helps. Discard the garlic now if you’ve left it in the bowl. Serve immediately, with extra grated bottarga on top. Bottarga comes in two basic types: tuna or mullet. The whole roe is salted, pressed and hung to dry, then sealed in beeswax. Whole bottarga is sold in vacuum sealed plastic and lasts more or less indefinitely. Bottarga is an ancient food, going back as far as the ancient Phoenicians and Egyptians, and enjoyed by the Roman times. (Some sources say the Arabs brought it to Sicily in the Middle Ages. The word bottarga is said to come from Arabic battarik, meaning ‘raw fish egg’.) Traditionally considered “poor man’s caviar”, like so many formerly rustic products it’s quite expensive today even if not quite as expensive as caviar. Fortunately, a little goes a long way. Like a fine hard cheese, bottarga is best bought whole and grated just before you want to use it. (It has a thin skin that needs peeling.) But they also sell powdered bottarga in small jars, which is actually a bit easier to find in supermarkets. It’ll do in a pinch, but—again like the cheese you buy pre-grated—is far less aromatic. There are any number of ways to make spaghetti alla bottarga. Perhaps more common than the uncooked sauce that I prefer, many recipes call for lightly sautéing the garlic in the olive oil as if you were making an ajo ojo before adding the grated bottarga off heat. Some grated lemon zest is a very common addition, as is minced parsley; a bit of peperoncino (hot red pepper) adds a bit of heat. There is a semi-rosso version, where you add some split grape or cherry tomatoes to the sautéed garlic to wilt a bit before adding the bottarga. In some recipes, the bottarga is thinly sliced rather than grated. Spaghetti is the classic pasta for this dish, but it is equally good, I think, with other long pastas like spaghettoni, spaghettini, linguine, trenette or even fettuccine. When the spaghetti is cooked, drain it (but not too well) and pour it into the bowl. Mix everything together well, adding some more olive oil and/or grated bottarga is you think it needs it. If things are a bit dry, some more pasta water helps. Discard the garlic now if you've left it in the bowl. I had hand cut pappardelle to use up. Bottarga, Parmesan (I know …no cheese with seafood but this is different), black pepper, chile flakes, EVOO, and crushed house-dried celery leaves (better than parsley). The Parm complimented the bottarga; the celery greens added “green-ness.” It was perfect! I prepare dishes as I go. Ingredients are never the same so adjustments have to be made. Bottarga is fantastic! Bottarga must be the same with Avgotaraho we have here. Your description sound exactly the same! Such a unique flavor, isn’t it? Pasta and avgotaraho is a combination quite uncommon in Greece but it does sound like something that could definitely be really good! Thanx so much for the delicious recipe Frank!!! I’ve seen many recipes for this and always noted that I wanted to try it – and then it landed in my e-mail.Thanks for that. On my to-do list. This is what usually happens with things like this! Last week I was at a gourmet food store and saw a sign for “bottarga”. I wanted to find out what it was, but got distracted and then the owner offered us wine and we started tasting chocolates and I completely forgot about the bottarga! I think it was the very next day, I saw your recipe for spaghetti with bottarga! I’m just now getting a chance to look at it, but it sounds so interesting, I’d love to try it! Lol! That kind of thing happens to me all the time. Anyway, worth a try! And if you can find bottarga at a local store,lucky you. I have to order mine online. Great post Frank. I adore the dish and even my 7 year old tried it when I made it recently and loved it. It’s rather addictive. I haven’t rubbed the bowl with the garlic before. I’ll have to try that next time, it’s a wonderful idea. Thanks! Thanks, Tina! I’m impressed that even your 7 year old loved it—that shows you’ve raised him/her to be open to new food experiences, and that’s great. è un modo semplice ma raffinato e gustosissimo per condire la pasta, io preferisco quella di muggine ma anche quella di tonno non è male, buona settimana Frank ! I don’t believe I’ve ever had this, and certainly haven’t made it. Sounds interesting! And like something I’d like. Thanks for the introduction. You’re welcome, John. Something definitely worth trying! 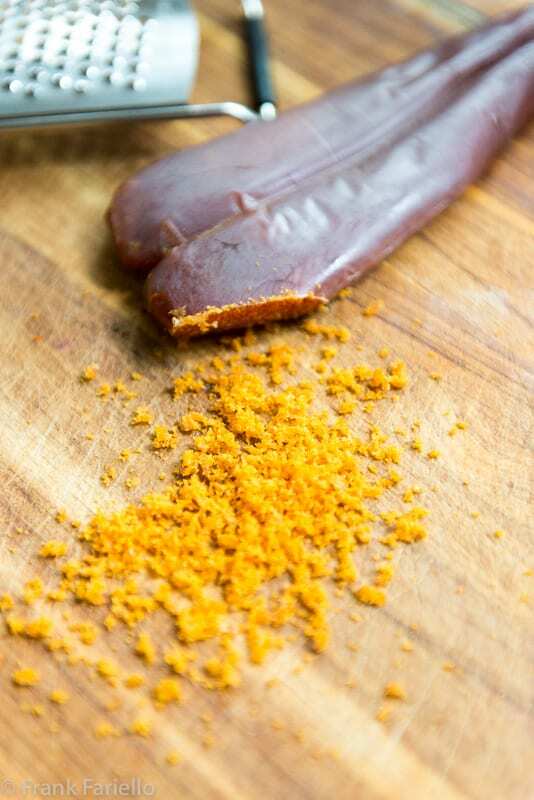 TIL about bottarga… thanks for the informational and tasty looking post. You’re welcome, Ben. And thanks for stopping by! The next time I am in San Francisco I going to La Ciccia to try this. I used to eat herring roe when I was a child. Is the bottargo similar? You now have me on a quest!! I have to find Bottarga and try this out. Hubby and I love fish and anchovies. I can’t wait to make it. The challenge will be finding the Bottarga since we’re in Indiana. Grazie!! It’ll be worth the search, I think. If you can’t find bottarga locally it’s available on Amazon. That’s where I got mine, in fact. We had variations on this often in Venice, and brought some mullet bottarga home. I can attest that it lasts pretty much forever, as I still have some from years ago and it is still wonderful! As I often say, simplicity like this is exquisite! Have a great weekend, Frank! Enjoy, David! Thanks for stopping by. …. In Italy, bottarga is sometimes served carpaccio style: finely shaved and dressed with oil and lemon (and celery) – which I always found too strong (bitter)…. ps bottarga also features in one dish that I have never tried, the Ligurian capon magro: an extravagant vegetable and fish salad. Frank, its official we were separated at birth! Spaghetti con la Bottarga is my go to at a favorite restaurant of ours in San Francisco, La Ciccia. The owner/chef is Sardinian, his wife & partner from the Veneto; on your next trip to SF we must meet there and have dinner. Without hesitation I order Spaghetti con la Bottarga, the staff need not ask for my order. Rubbing the bowl with garlic, a routine here with particular pasta dishes and salads – I smiled when you referenced it…. Your instructions and background details are on point and authentic, as always – bravo!